DNA from Kemet: does it really have all of the answers? What do you say to Eurocentrics who claim that the ancient Egyptians were European Caucasians and they have DNA evidence to to back it up? If you can access them*, read academic papers that are peer-reviewed by specialists within a particular field. This process is meant to ensure a certain quality control and involves the process of academic research being checked by two or three other scholars within that field before it is accepted for publication. In the Social Sciences and Sciences, the source of evidence and methodologies are rigorously checked. Egyptological research, unfortunately rarely utilises theoretical frameworks, models, or tested methods of investigation in the same way that other fields do. If you are struggling with the technical terms used in these papers then I would recommend that you look at the following workshop presented by Dr Shomarka Keita. Dr Keita is well qualified to write on both Kemite culture and biological genealogy. Has studied medicine, biological anthropology and Egyptology. I defer to his research because it is clearly evidenced, and when he presents it he explains any issues of interpretation that many other academics either assume non-specialists understand, or choose to disregard. *Many of these papers can be found by a using google scholar search and accessed for free because the authors have loaded PDFs onto their academic profiles or websites. Like many people I once assumed that DNA had all of the answers when it came to the genealogical ancestry of the people from Kemet. However, having attended workshops and conference papers by Shomarka Keita, and having had the privilege of discussing this subject with him in person, I now accept that this is not necessarily the case. Biological genealogy is one of a number of types of evidence that can be used to understand more about the people of Kemet. Others include: the physical and cultural geography of the land, the language, and the culture. In the workshop that is referenced above Dr Keita is keen to stress that these lines of evidence do not necessarily run parallel; and he is right to do so. My reasons for initially believing that science had the answers is that the other types of evidence listed above are restricted by the knowledge of the people who interpret them. I have noted previously that if cultural parallels are restricted then those who are investigating them are ignoring potential links to other groups simply because they are not aware that they exist. Similarly, in regard to language, very few people have the language skills that range from Ancient Kemite to other African regions. It is only in recent years that scholars such as Dr Abdul Salau have started to fully explore similarities between Yoruba and the language of Ancient Kemet. DNA testing also relies on comparison. This is a key point in answer to Charles’ question above. If, when you compare DNA samples, you do not have a large enough dataset, and if the model that you use is not rooted in African diversity then the results can be misleading. There are other methods rooted in the biological sciences to compare groups of people. Cranial and limb ratio studies are also used to determine shared physiological traits of groups of people. Models of ‘racial’ types work on the assumption that people who belong to the same group share well-defined sets of physical traits. Many people assume that if people look the same they must be connected, and by the same argument any difference is appearance is often explained through mixture. In his lecture Dr Keita uses the Berber people of North Africa as an example of how this approach can be misleading. Many people who belong to this cultural group have light skin, blue eyes and blonde hair. It is therefore often assumed that they have some kind of European ancestry. However, when their genealogy is compared to African and European groups they cluster with the former as Africans. I have noted in previous posts that people often work from the premise that in order to be categorised as ‘African’ an individual has to meet discreet criteria. This has led to the acceptance within Egyptology of ‘Nubians’ (see above) as African people but as Kemites as somehow mixed in terms of their racialised identity. In doing this, people fail to take account of biological variations of African people. 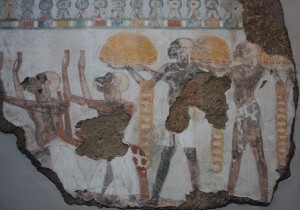 Whereas those who understand that there is variation in skin colour, physical features and hair types amongst people of African descent will make reference to the fact that Kemite artists showed this when they represented their people; others use an over-simplified interpretation of this variation to claim that the ancient people of Kemet were descended from Europeans. It is for this reason that the term Mediterranean is often used as a descriptor of the people of Ancient Kemet. In fact, I once heard a colleague who is a forensic anthropologist who works on human remains from Egypt insist that the term was a valid one. When I asked her to explain to me what she meant by the term Mediterranean she responded by stating that Egypt was on the Mediterranean coast. So she was using a geographical term to denote racial identity. I pointed out that more of Egypt is on the continent of Africa and asked why we could not use that term as a descriptor instead. I did not get an answer. The conversation was a public one during a lecture that I presented in Cambridge in 2014. I would urge people to look at the lecture I link to above, in which Shomarka Keita explains many of the pitfalls of categorising humans. It is also important to consider the historical and cultural links between groups of people as well as their genealogy. As I have previously noted, through archaeology and the study of Kemite material culture we can make many connections between the people of Kemet, and other cultural groups on the African continent. DNA offers one way to consider ancestry, but like other methods it can distorted. Author Kemet ExpertPosted on April 24, 2016 Categories DNA, KemetTags dna from kemet16 Comments on DNA from Kemet: does it really have all of the answers?